The Female Football Development Programme has secured an additional year's funding after it exceeded its player numbers target. Launched in 2013, the two-year scheme aimed to get 40,000 women and girls aged 14+ to participate in football - a target which was met. Now, more than £3.7m of Football Association and Sport England money will be invested to the programme. Earlier this month, England achieved their best ever World Cup finish. 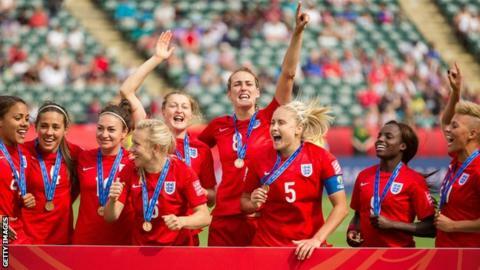 Mark Sampson's side came third at the tournament in Canada, the best by a senior England team outside of the men's 1966 World Cup victory. In the two years, the participation programme has attracted 42,462 new players into football, with an additional 21,060 new players being targeted in year three.